The Home Remodeling business has unique website & SEO needs. 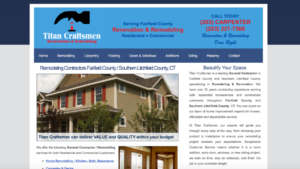 Our web designers understand Remodelers and how to design an effective website. From kitchen remodeling websites, bathroom remodeler websites, to general home improvement website design – we do it all! Our website designers work in all contracting industries to help your business succeed online! Contact us today and learn how we can help drive consumers to your website through SEO – Search Engine Optimization.